This is the name given to a category of large domestic appliances such as refrigerators, washing machines and dishwashers. Due to media attention given to the term 'CFC's' (chlorofluorocarbons) in the 1990's, there has been a tradition of recycling white goods since then. Images of discarded fridges dumped by the side of roadways helped to stop this practice of illegal dumping, and a campaign to show where such appliances could be taken to be safely recycled instead, got the issue of fridge and appliance recycling into the public consciousness. They are expensive but necessary consumer items, found in most home and business throughout the UK and it is important to consider how they can be recycled when they are replaced or come to the end of their working life. CFC's are a chemical coolant composed of carbon, fluorine, chlorine and hydrogen. This combination has traditionally been used as both refrigerant and as foam blowing agent within fridges, until 1994 when it became public knowledge that this chemical combination had a detrimental effect upon the ozone layer, and could easily leak from fridges, particularly if they weren't recycled properly. CFC's were replaced with HCFC's (hydrochloroflurocarbons) which don't have such a bad effect upon the ozone layer, but are still noxious chemicals nonetheless. With all white goods, it is a good idea to investigate how they could be reused or refurbished beforebeing recycled. There may be a scheme in your area which may collect still-working but unwanted fridges, freezers and dishwashers. Also consider giving your old appliance to a homeless shelter, or to an individual in need in the community. Your local Social Services can give advice about this. Your local recycling centre should be able to accept and safely recycle your old appliances, including dishwashers, fridges, and washing machines. Check with them, or your local Council about this facility. 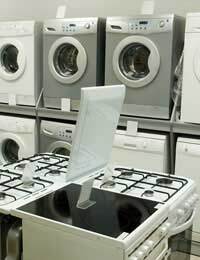 When preparing to take your appliance to the recycling centre, always make sure it is empty and clean. Safely recycling white goods means removing hazardous materials, such as CFC's and HCFC's, and then shredding and recycling the steel and plastic components. Recycling centres are the best place to go if you need some trays or shelves for your fridge or freezer, or a drum or a new door or seal for your washing machine!You can usually pick up these recycled parts at very cheap prices. Be creative! Also, watch the consumer marketplace for new developments and innovations in materials and substances that make these white goods more recyclable and safer in the future. Look out for an alternative technology called 'green freeze' which is an eco-friendly fridge that doesn't use harmful gases. Remember that consumers have buying power, and buy goods with recycling in mind. I have start salvage stuff for my personal use, but have a fridge freezer which i'd like to take the metal side panels and dismantel the rest of it sell or reuse, is there any legalities I need to know about? especaully to do with the chemical bottle at the back? get in touch asap, UK, England laws?